Dignitaries take a tour of Southwest Key Programs Casa Padre, a U.S. immigration facility in Brownsville, Texas, where children are detained. When school leaders in San Benito, Texas, learned of an influx of children to a migrant shelter in town, they felt obliged to help. The superintendent reached out and agreed to send 19 bilingual teachers and hundreds of computers to make the learning environment as similar as possible to one of his schools. When San Benito, Texas, school leaders learned of an influx of children to a migrant shelter in their small town near the U.S.-Mexico border, they felt obliged to help. The superintendent reached out and agreed to send 19 bilingual teachers, mobile classrooms and hundreds of computers to make the learning environment resemble one of his schools. While a government contractor bears responsibility for educating children at the highly guarded center, local officials say they stepped up partly because of a law that calls on school systems to educate any child, anywhere within their district. “This is not a political issue. This is not a racial issue. This is a moral obligation, and actually our legal obligation,” said Michael Vargas, who leads the board of the San Benito Consolidated Independent School District. San Benito is one of a small number of U.S. school systems that are preparing for the first day of school on both their public campuses and in new classrooms set up at nearby federal youth migrant shelters. In neighboring Brownsville, Texas, the superintendent is working on an agreement to deploy teachers and services to help educate 800 children housed in federal facilities in her district. The school systems pitched in amid an outcry over the separation of children from their parents at the U.S.-Mexico border under the Trump administration’s zero-tolerance policy for illegal immigration. Several hundred children remain separated from their parents, but most of the thousands of young people held in federal shelters across the U.S. are unaccompanied minors who arrived in the country without their families. The Associated Press inquired with public school districts in 61 cities nationwide where shelters are known to exist within their boundaries. Among the 50 that responded, most said they had no contact with the shelter or federal program authorities. Some outside the border states, including Camden, New Jersey, said they only recently discovered the existence of migrant shelters in their community. Many noted they would educate all children regardless of immigration status, as required by law, if their families or legal guardians sought enrollment on their campuses. “Until this becomes a real-time issue for us, we have no official position,” said Superintendent Dennis Blauser of the Oracle, Arizona, school district. 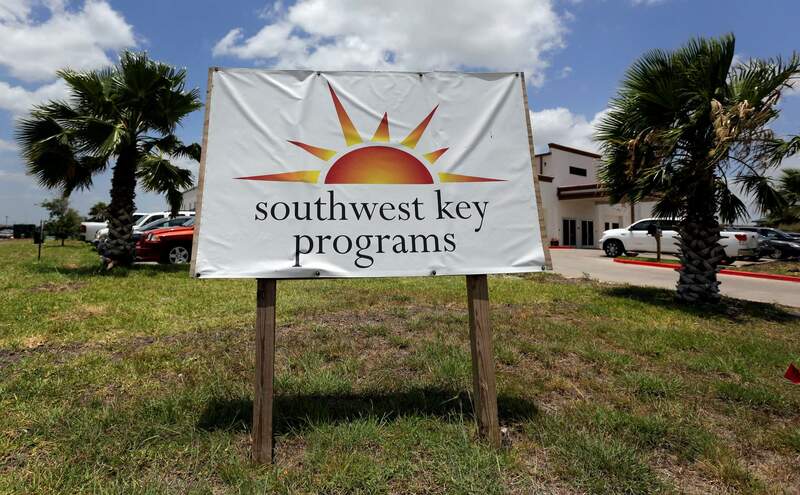 The Southwest Key-Nueva Esperanza, in Brownsville, Texas, a facility that shelters unaccompanied immigrant children. When school leaders in San Benito, Texas, learned of an influx of children to a migrant shelter in town, they felt obliged to help. The superintendent reached out and agreed to send 19 bilingual teachers and hundreds of computers to make the learning environment as similar as possible to one of his schools. In Texas, some districts already had longstanding agreements to run classrooms with public school teachers at migrant shelters. By law, the federal contractors that operate the shelters are required to have a “care provider” give children six hours a day of structured learning time. Southwest Key, the largest contractor operating such facilities, has agreements with two school districts, including San Benito. It is also working to create partnerships with the Brownsville Independent School District and with a charter school network run separately by Southwest Key’s parent organization. 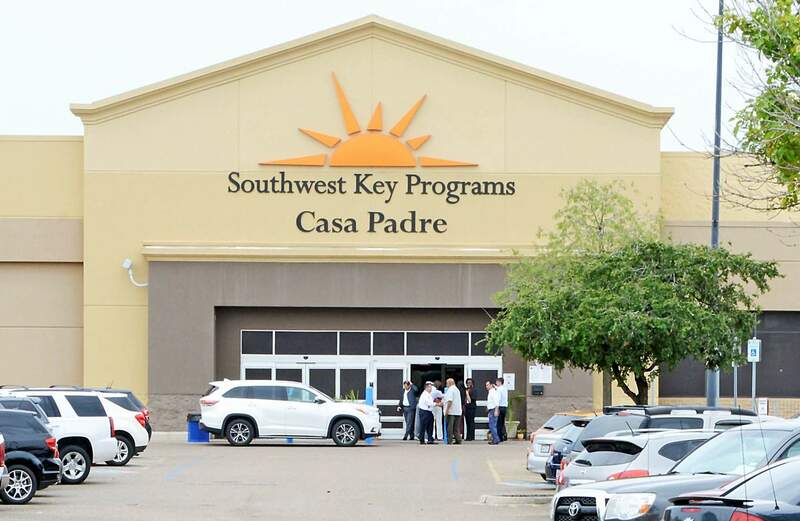 Salvador Cavazos, Southwest Key’s vice president of educational services, said the nonprofit shelter operator has for years offered great basic services but is now welcoming more help from outside school systems as an enhancement as the number of children in its care grows. He said Southwest Key gets appreciative feedback from families after the average 30- to 45-day stay for each child, and most students leave with some level of academic gain. He said the children do “a lot of good work” studying through a project-based curriculum that is aligned with state standards. “They do history projects. They do class presentations. They do read-alouds with the books and novels that they’re reading,” said Cavazos, a former school teacher and administrator. The districts’ role is largely limited to their regular school year, though the shelters also provide supplemental curriculum during summer months. Rochelle Garza, a Brownsville, Texas-based attorney who advocates for the children in court noted the students can be detained for a semester or more with repeating instruction as other kids cycle in and out. Brownsville Superintendent Esperanza Zendejas said she felt a responsibility to honor the spirit of a 1982 U.S. Supreme Court ruling that affirmed all children in the United States are entitled to enroll in their local public school district for a free education. Zendejas said the district also has an obligation to work around the troubling circumstances of such a vulnerable population of children, just as the law enforces for homeless children. She said her school district is well-equipped and willing to handle the important task, and ready to provide teachers and special education, bilingual and support services. “The question of who gets educated in our country is coming up, and my belief is everybody should receive an education if you are in this country,” Zendejas said. But Thomas Saenz, president of the Mexican American Legal Defense and Educational Fund, said the children should be released from custody and be allowed to learn at public school campuses instead of the schools creating an inadequate experience within the confines of the shelter. “It’s not a time for amateurs, and some school districts are frankly amateurs in dealing with short-term incarcerated youth after trauma” from family separation, Saenz said. The San Benito school district’s agreement with Southwest Key, signed in May, is modeled on a similar arrangement in Harlingen, Texas. It gives the district control of curriculum and instruction, while Southwest Key has responsibilities that typically would fall to a guardian, including getting the children ready for school. It also requires facility staff to assist in the classrooms and intervene in the event of a crisis. The district said it will recoup its costs for the teachers and the 570 Chromebooks and laptops on the federally contracted sites by counting those children as part of its official enrollment. The district expects that will bring in about $2.8 million in state funding. Still, there has been some blowback from critics over a school district that in recent years struggled financially. Vargas, of the San Benito district board, said he was confronted with unexpected hostility by some in the impoverished border town who fear the plan will siphon resources from their own schools. “I would hear it from other people going to church: ‘Why are we going to help – insert derogatory term – kids?’” he said. The Texas Education Agency has said local school districts intervening would be doing so voluntarily because the legal obligation to provide educational services to children in federal detention lies with the federal government. Cavazos said Southwest Key’s ultimate goal is to help the children transition into a regular classroom environment so they can continue their education. “I would hope that they are able to thrive in the communities that they end up (in), even if it is their home country,” he said.